Cabomba (Cabomba caroliniana) was deliberately cultivated as an aquarium and pond plant in the past. However, it is now illegal to grow or sell this species in Australia and it should no longer be present in cultivation. This species is not yet widely naturalised, and is currently found mainly in the coastal districts of eastern Australia. 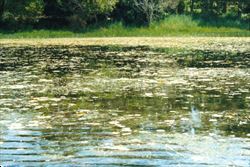 It is most common in water bodies in south-eastern Queensland and northern Queensland, but is also becoming common in eastern New South Wales. Also recorded in Victoria (e.g. near Dollar in South Gippsland, near Lake Benalla and in Lake Nagambie) and the Northern Territory (i.e. at Marlow Lagoon in Palmerston and along the Darwin River, approximately 40 km south of Darwin). Also naturalised in Peru, Asia (i.e. China, India, Japan and Malaysia), New Caledonia, Canada, and beyond its native range in western and north-eastern USA. 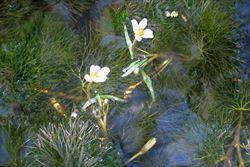 A weed of ponds, dams, lakes and slow-moving waterways over a wide range of wetter climates (i.e. tropical, sub-tropical and warmer temperate regions). A long-lived (i.e. 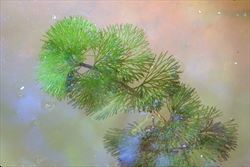 perennial) underwater (i.e. mostly submerged) plant that is usually rooted to the ground in water 1-3 m deep, but it can occasionally be free-floating. 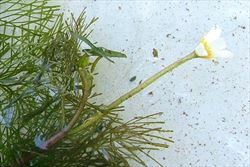 a long-lived, mostly underwater, plant with stems that are often covered with a thin layer of jelly-like slime. 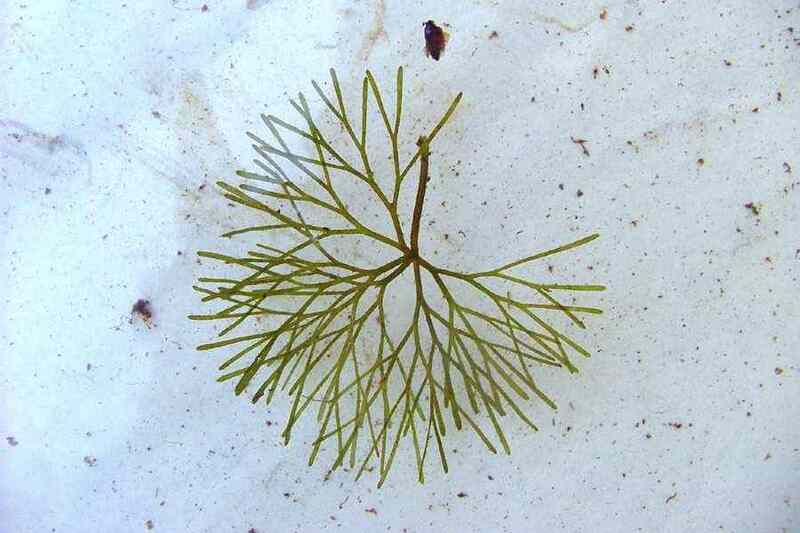 its oppositely arranged underwater leaves (3-7 cm in size) are finely divided and have a fan-shaped appearance. its inconspicuous floating leaves are small (up to 20 mm long), narrowly oval or elongated in shape, and have entire margins. 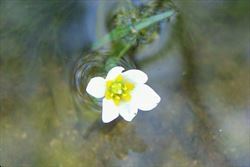 its small white flowers (6-20 mm across) have a yellowish centre and are borne just above the water surface. This species usually reproduces and spreads vegetatively via stem fragments, so seedlings are generally not seen. The branching stems are slender (i.e. 1-2 mm thick), rounded, covered in small whitish or reddish-brown hairs, and grow up to 10 m long. The stems and underwater (i.e. 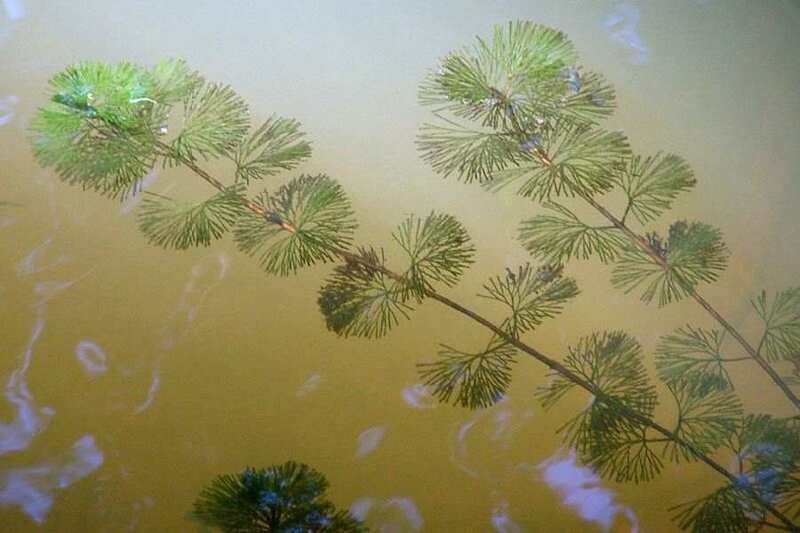 submerged) leaves are covered with a thin jelly-like (i.e. gelatinous) coating. Two totally different types of leaves (i.e. dimorphic leaves) may be found on this species. The underwater (i.e. submerged) leaves (3-7 cm long) are oppositely arranged, or sometimes arranged in whorls, and are divided several times (i.e. deeply dissected). These fine divisions give the leaves a feathery, fan-shaped, appearance. A few floating leaves are sometimes present (i.e. on or just above the water surface). These are smaller (up to 20 mm long), narrowly oval or elongated (i.e. elliptic or lanceolate) in shape, with entire margins. The underwater (i.e. submerged) leaves usually have stalks (i.e. 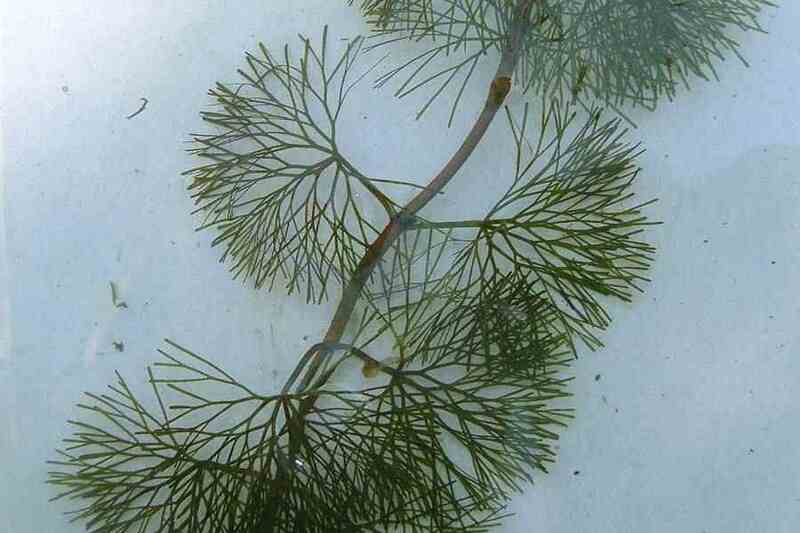 petioles) up to 30 mm long, however the uppermost submerged leaves may be stalkless (i.e. sessile). The floating leaves have stalks (i.e. petioles) 20-50 mm long that are attached to the undersides of the leaf blades (i.e. the leaves are peltate). 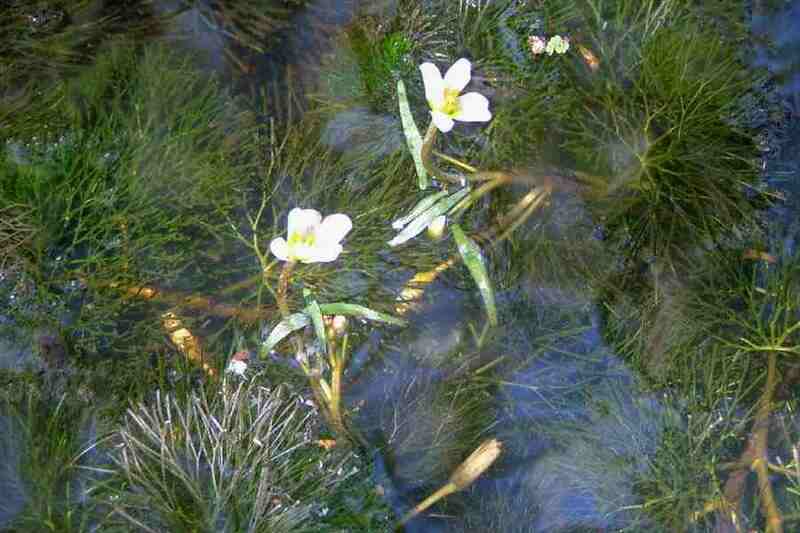 The small flowers (6-20 mm across) are borne just above the water surface. They are white or cream in colour, sometimes with a pinkish tinge at the tips, and have a yellow centre. Each flower has six 'petals' (i.e. tepals or perianth segments), which are actually three petals and three sepals (4-12 mm long) that closely resemble each other, and six yellow stamens (about 4 mm long). These flowers are borne singly (i.e. they are solitary) on short stalks (i.e. pedicels) 10-40 mm long that are produced in the upper leaf forks (i.e. axils). Most flowering occurs during summer and autumn. The fruit consists of two to four, bottle-shaped, leathery segments (4-7 mm long), each containing 1-3 seeds. Seeds are oval (i.e. ellipsoid) in shape (1.5-3 mm long and 1-1.5 mm wide), turn brown as they mature, and are covered in a jelly-like (i.e. gelatinous) slime. However, seeds are rarely, if ever, produced by plants growing in Australia. This plant mainly reproduces vegetatively via its creeping underwater stems (i.e. rhizomes), and by breaking up into stem fragments. It can also reproduce by seed, but seeds are generally not produced in Australia. Stem fragments and rhizomes are most often spread by water movement, boats, and in dumped aquarium waste. Cabomba (Cabomba caroliniana) is regarded as one of the worst weeds in Australia and is a Weed of National Significance (WoNS). This is largely because of its invasiveness, potential for spread, and environmental impacts. It is already a significant environmental weed problem in some of the coastal districts of Queensland and NSW, but it has the potential to become a much greater problem in all Australian states and territories. 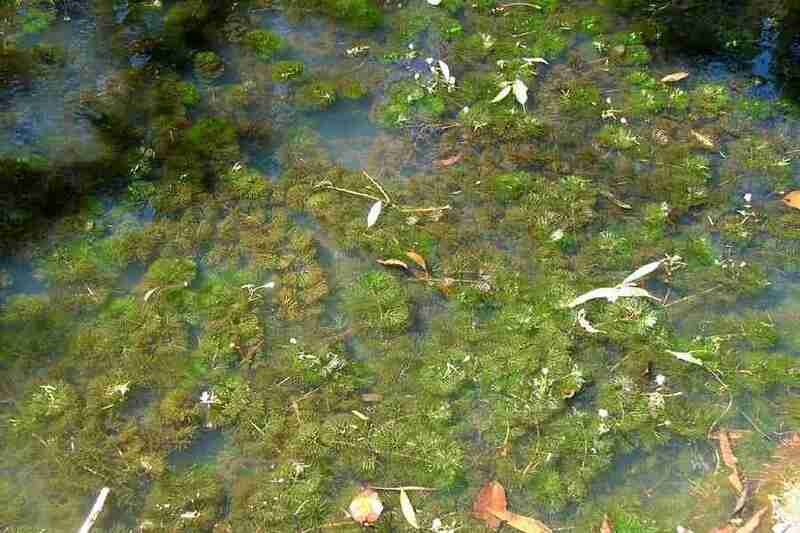 It grows quickly and produces a large amount of plant material which chokes waterways. 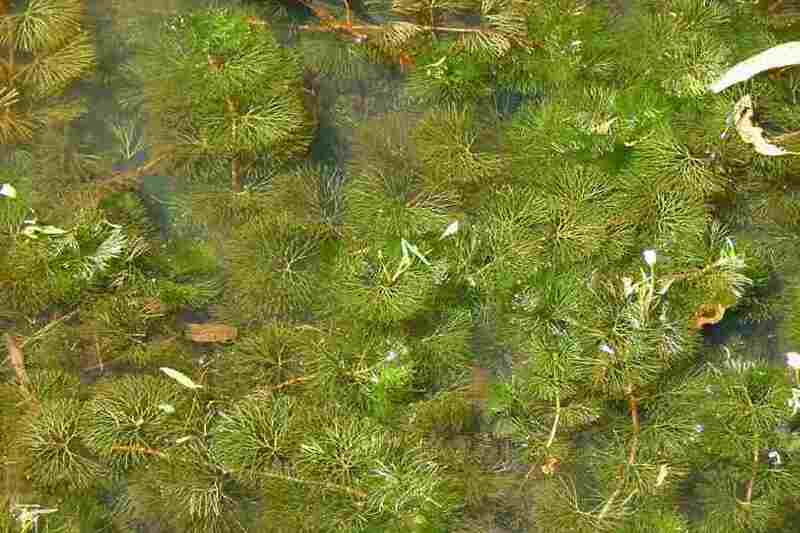 It is extremely persistent and can take over a water body, forming a monoculture and excluding native plant species. When this vegetation dies off, decomposition can cause a dramatic reduction in the oxygen levels in the water, which can lead to the death of fish and other aquatic animals. Cabomba (Cabomba caroliniana) infestations are also thought to have an impact on larger native animals (e.g. in northern Queensland platypus and water rat numbers are lower in infested creeks). Because of its invasiveness in Australia and other parts of the world, this species is listed in the Global Invasive Species Database. 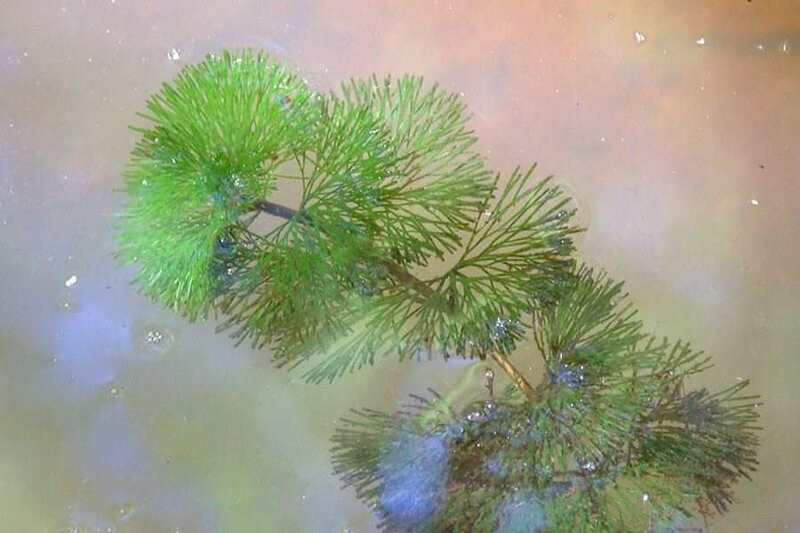 Cabomba (Cabomba caroliniana) can clog waterways to the extent that it reduces water storage capacity, interferes with pumping equipment and taints drinking water supplies. This can cause water treatment costs to be increased and heavy infestations can raise water levels to a point where overflows and heavy seepage losses occur. 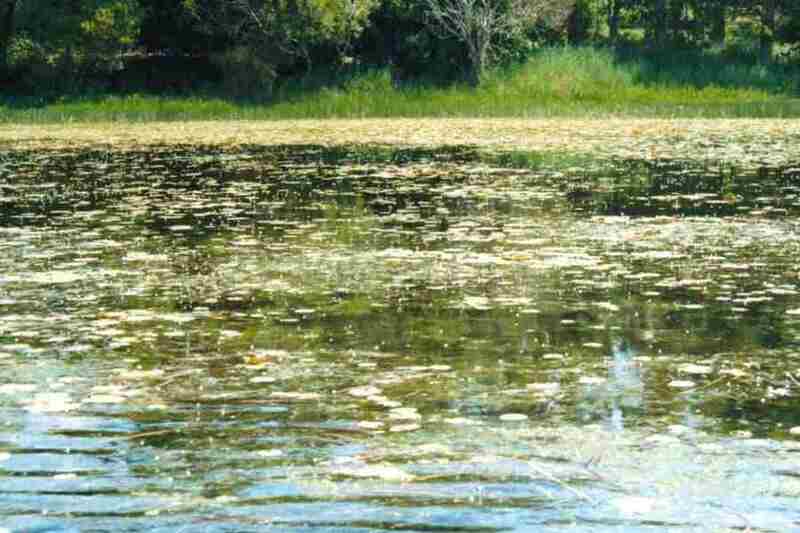 Its dense mass of underwater stems and leaves provide a hazard for recreational water users (i.e. it impedes fishing and swimming) and its decomposition can result in foulsmelling water. It can also improve mosquito breeding conditions, thereby increasing the risk of the spread of mosquito-borne diseases. ACT: C1 - notifiable pest plant (a pest plant whose presence must be notified), and C4 - prohibited pest plant (a pest plant whose propagation and supply is prohibited). New South Wales: Class 5 - a restricted weed which must not be sold, bought or knowingly distributed (throughout the entire state). Northern Territory: A - to be eradicated (throughout all of the Territory), and C - not to be introduced into the Territory. This declaration also applies to all species of cabomba (i.e. Cabomba spp.). Queensland: Class 2 - landowners must take all reasonable steps to keep land free of this species (throughout the entire state). It is also illegal to keep or sell a Class 2 plant without a permit. This declaration also applies to all species of cabomba (i.e. Cabomba spp.). South Australia: 11+ - Class 11 is a category for those species that are 'Weeds of National Significance' but are not otherwise declared in South Australia. Control of this species is not currently required in this state but it is restricted from sale. Tasmania: D - the importation or sale of this species is prohibited and measures to reduce its population in an area, eradicate it from an area, or restrict it to a particular area may be required. Details on actual restrictions or measures for each declared weed are contained in the weed management plan for that species. Victoria: R - a restricted weed that poses an unacceptable risk of spread if it were to be sold or traded. It must not be sold, bought or knowingly distributed (throughout the entire state). the National Weeds Strategy Strategic Plan for this species, which is available online at http://www.weeds.org.au/docs/cabstrat.pdf. the Victorian Department of Sustainability and Environment Landcare Note on this species, which is available online at http://www.dse.vic.gov.au. cabomba (Cabomba caroliniana) has finely-divided, fan-shaped, leaves that are usually oppositely arranged and borne on stalks (i.e. petioles) up to 30 mm long. 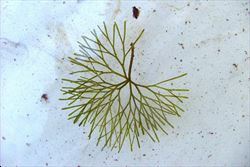 The leaves and stems are mostly underwater (i.e. submerged) or floating directly on the water surface. Its whitish coloured flowers have six 'petals' (i.e. tepals) and are borne just above the water surface on relatively long stalks (10-40 mm long). parrot's feather (Myriophyllum aquaticum) has finely-divided leaves that narrow towards the tips and are arranged in clusters (i.e. whorls) of 4-6 along the stems. 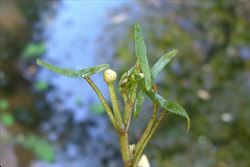 The leaves and stems usually emerge some distance (i.e. up to 10 cm or more) above the water surface. Its inconspicuous greenish or yellowish coloured flowers have four 'petals' (actually sepals) and are borne on very short stalks in the leaf forks (i.e. axils). hornwort (Ceratophyllum demersum) has finely-divided leaves that are arranged in clusters (i.e. whorls) of 7-12 and are stalkless (i.e. sessile). 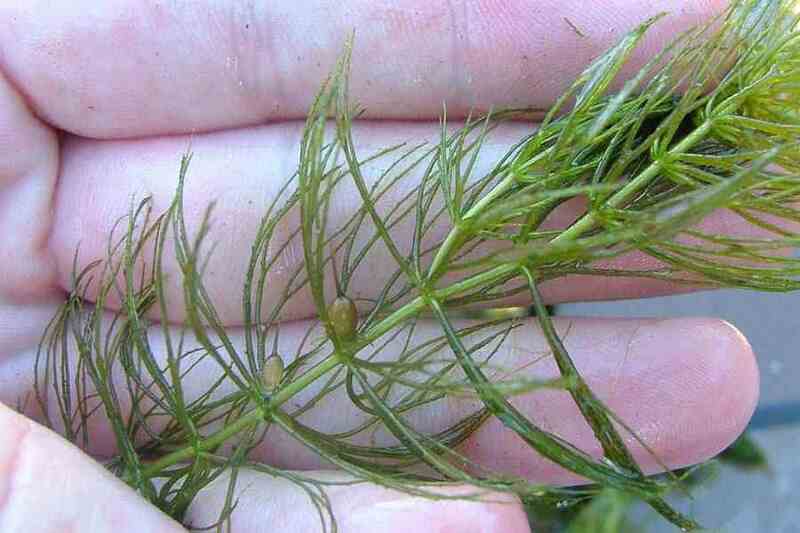 The leaves and stems are mostly underwater (i.e. submerged) or floating directly on the water surface. Its inconspicuous flowers are stalkless (i.e. sessile) and borne below the water surface. 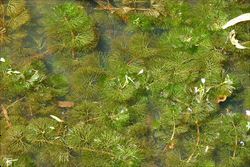 Cabomba (Cabomba caroliniana) is also relatively similar to other submerged plants including dense waterweed (Egeria densa), elodea (Elodea canadensis), hydrilla (Hydrilla verticillata) and lagarosiphon (Lagarosiphon major). However, these species all have narrow, undivided leaves that are densely arranged in whorls along the stems. Another very similar species, pink cabomba (Cabomba furcata), is also sometimes grown as a aquarium plant. It can be distinguished by its reddish coloured leaves and pink or purplish flowers.